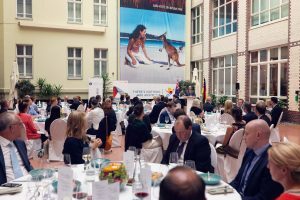 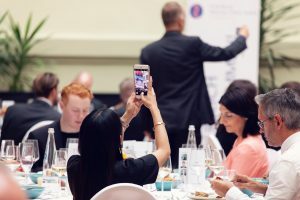 After a four year long wait, the German Australian Business Council’s festive Ambassador´s Dinner returned to Berlin on 21 June, 2018. 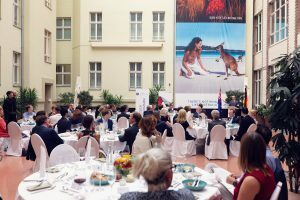 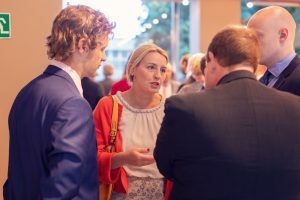 Held at the Australian Embassy in the city centre, this year´s edition of the well-established dinner format brought together guests from various business and economic sectors as well as friends and supporters of the German Australian Business Council. 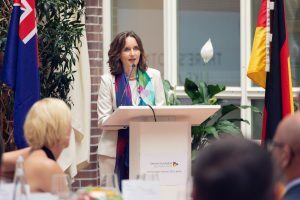 Two keynote speeches were introduced by a welcome from Dr Sabine Pittrof, Chair of the German Australian Business Council. 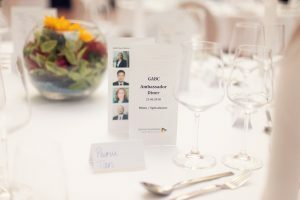 The evening was moderated by Board Member, Evangelos Kotsopoulos and Board members Simone Wienhausen and David Urry gave a farewell after awarding the raffle prize draw. 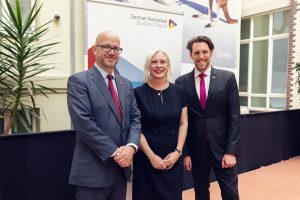 In the first keynote, attendees heard from German Australian Business Council patron, Richard Leather, Australia´s Consul General and Senior Trade Commissioner (Europe). 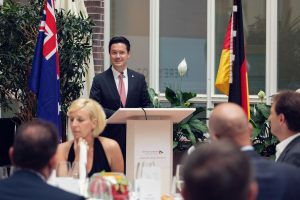 Richard focused on overall bilateral relations between Australia and Germany and the remarkable work achieved between various working groups over the past few years. 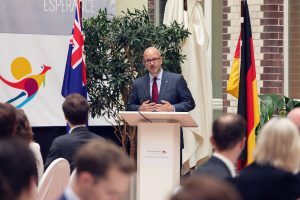 Citing the recent Perth conference as a highlight, he turned to the upcoming negotiations around an EU-Australia Free Trade Agreement and showed the advantages such arrangement would have. 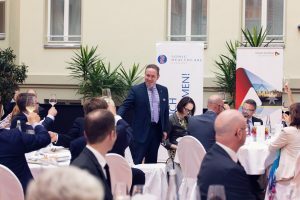 This year´s second keynote was delivered by Mr. Terry Nichols, General Manager of Rheinmetall Defence Australia (Electronic Solutions). 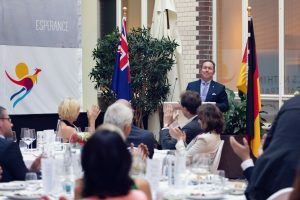 On his birthday, Terry explained the nature of German defence industry group Rheinmetall´s presence in Australia and discussed the group’s recent successful bid for a large Australian Government contract. 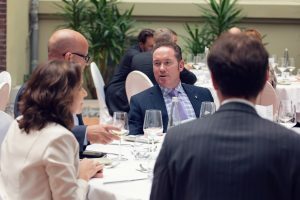 It was interesting for the audience to hear about the specific, long-term and complex nature of the very large defence procurement projects in which companies such as Rheinmetall and others participate. 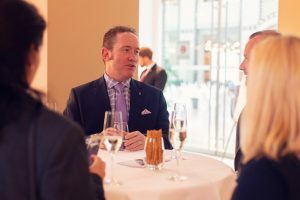 Over a three-course dinner, the guests enjoyed in-depth conversation and a relaxed evening. 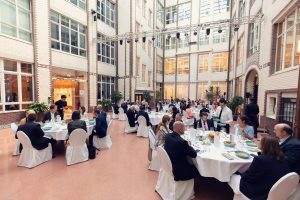 Special thanks go to this year´s sponsors who made this event possible in the first place. 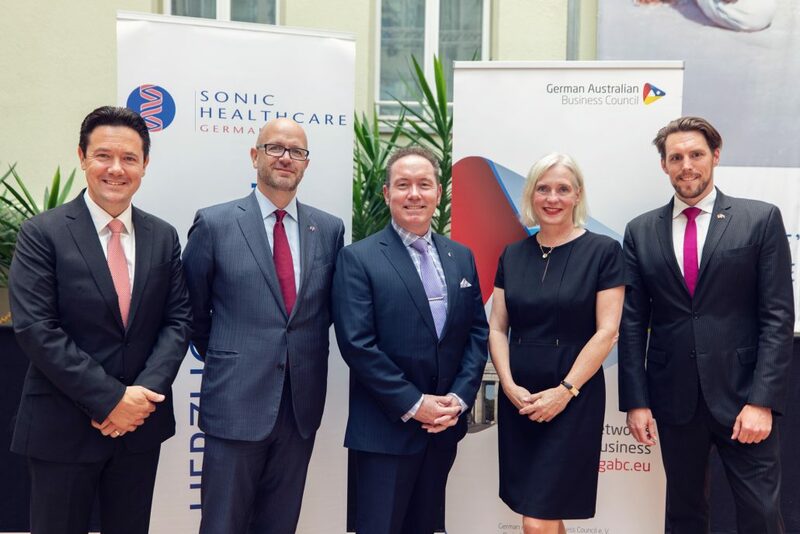 Sonic Healthcare Germany (gold sponsor) as well as the State of South Australia and Aesop kindly supported the evening.